Visiting Chinese President Xi Jinping called on Sunday for more vigor and cooperation to boost ties between China and Caribbean nations. China’s president has offered concessionary loans to nine Caribbean countries totalling some $3 billion, Trinidad & Tobago’s prime minister said Sunday. Prime minister Kamla Persad-Bissessar told reporters that the loans would be earmarked for infrastructure and development projects across the Caribbean. “We really welcomed that generosity,” she said. The Chinese president also pledged to carry out projects including airport, hydro-power generation plant and e-government in Guyana. 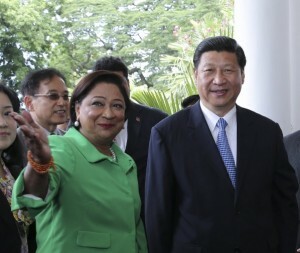 In Trinidad, Xi also announced that China was awarding a $250 million loan to build a children’s hospital. Xi is on a state visit to Trinidad & Tobago, Costa Rica and Mexico. The Chinese president and President Obama will meet from June 7-8 in California – the first of this kind since both nations have ushered in new leaders.